Guests who visit Black Mountain usually come in two varieties, those who stay often and those who are here for the first time. For those who come time after time, their agenda is often just for rest and relaxation. They might walk through town or along tree lined residential streets. There they stroll through the numerous upscale gift shops, galleries and Appalachian style craft stores, with unique local craftsmen demonstrating iron works, wood bowl turning and hand thrown pottery. They might spend an hour or more exploring the local old fashion general store, with its 35,000 item inventory. And finally they’ll take a break outside the corner ice cream parlor with a hand dipped cone. After a wonderful dinner at one of Black Mountain’s many fine restaurants, regular visitors will schedule a “digestive” walk around Lake Tomahawk. Just a few blocks from town in our quaint city park, Lake Tomahawk offers a well lighted level path for safe strolling in the evening. 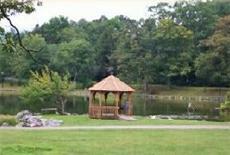 Adjacent to the lake are open lighted tennis courts and a children’s playground. For the diehard golfer, Black Mountain offers a superb 18-hole golf course set against wooded hillsides and a small meandering creek. A quality course with conditioned greens, the Black Mountain links can prove surprisingly challenging, especially with the longest par 6 in the nation off its 17th tee box. Guests are advised to coordinate tee times (828-669-2710). Other public golf courses of note in the area include Reems Creek (828-645-4393) and Mt. Mitchell Golf Course (828-675-5454). Both are within an hour’s drive of town, and are each ranked by Golf Digest for their layout and beauty. Many of our guests have come to know Black Mountain through the numerous conference centers located within a few miles of the town, including Ridgecrest, Blue Ridge Assembly, The Cove, and Christmount. The small township of Montreat, the home of the Reverend Billy Graham, actually abuts the city limits of Black Mountain and is a unique and charming village in itself, with a small liberal arts college and the Montreat Conference Center. If exploring this area, be sure and check out the breathtaking Ben Long fresco in the new chapel on the campus grounds. Many of the folks who come to Black Mountain are interested in hiking and enjoying the gorgeous foliage and mountain scenery. Hiking and biking trails abound within minutes of the Red Rocker, from up in the fringes of Montreat, to across Ridgecrest along the pass to Old Fort, to the trails behind Route 9. They vary in skill level, from an hour’s easy hike to Lookout Point, to an all day strenuous trek across the Seven Sisters mountain range. And if a challenge is really needed, why not consider the Ultra Marathon up to Mount Mitchell from Lake Tomahawk, held every February? Not for the faint of heart! Within an hour from town are numerous terrific vistas as well. The Blue Ridge Parkway can be found just eight miles away along Highway 70. Heading north from there is the Folk Art Center, headquarters of both Parkway information, and the Highland Craft Guild with its wonderful assortment of quality craft pieces. The trails and picnic areas of Craggy Gardens are famous, and on a clear fall or spring day the breathtaking views atop Mount Mitchell, the tallest mountain in the Eastern US, are without parallel. South on the Blue Ridge Parkway are Cold Mountain, made famous by the wonderful Charles Frazier book, and Mount Pisgah, home to the Graveyard Fields Trail, another wonderful series of foot trails. Obviously, everyone who comes to this area is familiar with the Biltmore Estate in Asheville, the amazing 250-room home of George Vanderbilt (just 15 minutes from the Red Rocker). There are planned activities year round at the Estate, from the spring flowers (they plant over 10,000 tulip bulbs every year) to the summer concerts to the Christmas candlelight tours (miles of fresh garlands and over fifty Christmas trees). Be sure to coordinate ticket purchases either with the Red Rocker or with the Estate itself (800-242-6480). There are plenty of other wonderful experiences within a short drive of Black Mountain as well. Nothing beats a hot buttered rum in the lobby of the Grove Park Inn, with the huge fireplaces burning. Or how about a free stroll through the miles of trails at the North Carolina Arboretum? Learn all about the forestry system at the Cradle of the Forestry. And downtown Asheville, filled with galleries and upscale stores, can be discovered along the unique 1.7 mile Urban Trail, examining wonderful architecture and bronze sculpture while following simple arrows and directions. 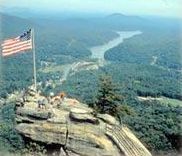 For additional day trips (most within an hour’s drive from town), consider cruising the loop up and around Grandfather Mountain to Boone and through to the Linville Falls. Another day well spent winds down through Brevard and Highlands, Transylvania County, Sliding Rock and the numerous waterfalls available from short hiking trails. Or how about a Smokey Mountain train ride through heavy forests or a raft trip down the Nantahala River? Or, if you feel lucky, try your hand at a Las Vegas style casino on the historic Cherokee Indian Reservation. Lots to do and see — the only difficulty might be deciding what to do and when, and how to squeeze it all in. And if the thought is enough to weary a traveler, the best advice might be just to lean back in a rocker on the front porch of one of our inns and rest a while, until the urge passes. Either way, Black Mountain is the perfect place to make the decision.